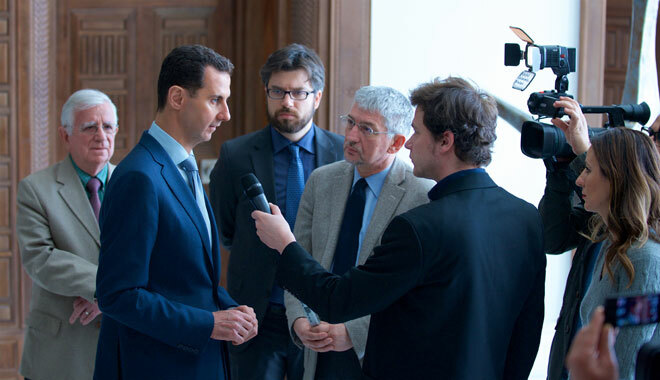 Question 1: Mr. President, yesterday in Damascus, another attack. The situation in Syria is still dangerous. Then, what do you think about the word of Netanyahu about the role of Iran here in Syria, and if you have your opinion about Donald Trump? President Assad: You’re talking about different aspects of the problem, which is very complicated because of the external intervention. When you talk about the terrorists in Syria, terrorist attacks like what happened yesterday in Damascus, that’s been happening maybe on daily basis, if not hourly basis in some cases. As long as you have terrorists anywhere in Syria, every Syrian citizen is in danger, this is for sure. The question here: who supports those terrorists? And that’s what I would like to raise as a question for the European officials that went in the wrong way since the beginning of the crisis in Syria and led to the destruction of Syria and prevailing of terrorism in the region, that led to terrorist attacks in many European countries and the refugee crisis. Now, if you want to talk about the European role, or the Western role, because it’s been led by the Americans, the only role is to support the terrorists until the moment. They didn’t support any political process, they only talk about political process, but there’s no real commitment to any political action till that moment. While if you talk about the role of Iran, it’s completely different. They support Syria in fighting terrorists, they support Syria politically, in the regional and international political arenas. Israel from the other side supporting directly the terrorists, whether logistically or through direct raids on our army in the neighboring area. Question 2: My question is: if you would describe from your point of view the nature of relation between Russia and Syria at the moment, because in the media, in the world press, it is described in a wide range, from fruitful cooperation to colonization even. So, what are they doing here? 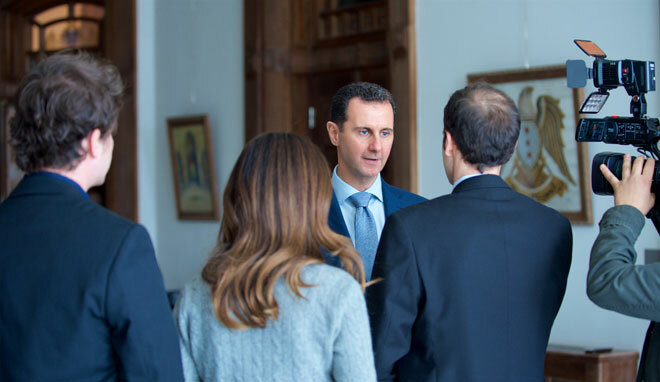 President Assad: Let’s talk about the reality, about the facts; since the Russians started their raids against ISIS in cooperation with the Syrian Army – of course after we asked them to come and support us in our fight against the terrorists – ISIS has been shrinking. Before that, there was what they called American alliance or the Western alliance against ISIS, which is a cosmetic alliance, ISIS was expanding. So, they started talking about the Russian role in that negative way only after they started succeeding on the ground. But first of all, in reality, Russia succeeded with the Syrian Army in fighting the terrorists, and the recapture of Aleppo and Palmyra recently and many other areas is the concrete evidence, so we don’t have to talk about opinions; it’s a fact. 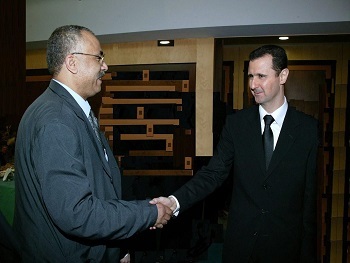 Regarding the political relation with the government, since the beginning of this – not only intervention; the support, before sending their troops to Syria, I’m talking about the beginning of the war six years ago – since that time, every political step and later military step that has been taken regarding the Syrian issue was in consultation with the Syrian government. This is their policy, and this is their behavior. Their policy and their relation with Syria are based on two things: first of all, the sovereignty of Syria, which is part of the Charter of the United Nations, and the sovereignty of any country. The second one is on morals, based on morals, that’s why there’s no colonization, there’s relation that goes back to more than six decades between Syria and Russia, and it has always been like that in different circumstances. Question 3: Mr. President, this war is very long, four hundred thousand victims, there are millions of refugees, and the UN accuses you as responsible, and they say that, many people from other sides, they ask you to be out of the power in order to get the peace. How do you answer to this question? 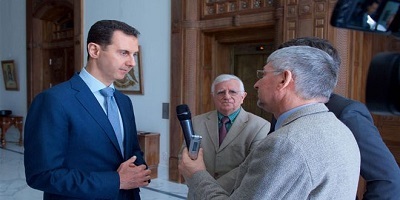 President Assad: First of all, the Syrian people should choose their president and should hold anyone accountable for any conflict and problem, not the United Nations, it doesn’t have any role, and we all know that since the collapse of the Soviet Union there’s no political balance in the United Nations, because some countries in the Security Council, the permanent countries like France, UK, and the United States, they tried to use the United Nations for their own political agenda and to topple governments whenever they don’t obey or comply with their agendas. So, talking about the president should go or come, for me personally, I only listen to the Syrian people, I don’t care what the UN say, or any other official outside Syria would say about that. I think, when you talk about these refugees and killing, when you started your questions, we should know that part of those killings was by the hand of the Europeans, not directly, but through supporting the terrorists from the beginning, and still calling them till that moment “moderate,” and they know that this is an illusion, there are no moderate militants in Syria, all of them are extremists, and whether they are moderate or not, whenever you hold a machinegun and armament and kill people and destroy properties, you are a terrorist, in your country, in my country, anywhere, nobody can say that there’s a moderate killer or moderate terrorist, we don’t have such a term. Second, regarding the refugees that you just mentioned, especially to Europe where you belong, not all the people left because of the terrorist attacks or the destruction, many of them left because of the embargo, so actually the embargo of the West and Europe is complimentary with the destruction and killing attacks of the terrorists in pushing those people to leave their country to other places, like Europe. Question 4: My question is: have you, or have you ever had any regret about the way you and the government handled the crisis since the beginning? Do you ever feel guilty for something, and would you change something you did in the recent past if it’s possible? President Assad: First of all, you have to differentiate between the opinion of the president or the official and his duty. The duty is derived from the constitution. 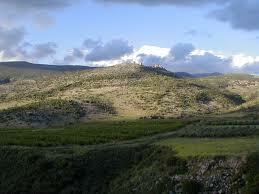 The duty of the Syrian government and every Syrian official is to defend his country. If we don’t defend it, this is where you can feel guilty, and this is where we should regret, but how could you regret defending your country? This is first. 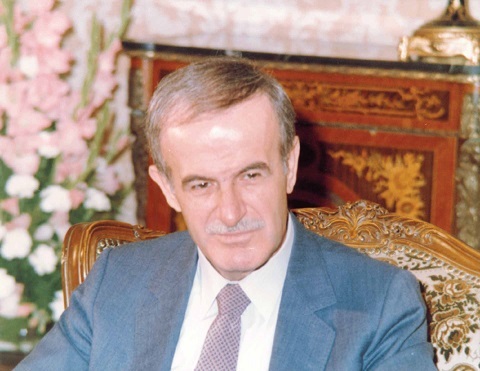 Second, our opinion was – which is not related to the constitution – is to make dialogue with every Syrian including the militants, which is very open because no such country would say, or no such government would say that I would make dialogue with the terrorists, but in our case, we said no, we are going to make dialogue even with the terrorists in order to save the Syrian blood. So, how can we regret making dialogue and being open? No, we cannot. So, if you want to talk about regretting implementing something, every kind of policy has mistakes in the implementation, this is something different, this is something you don’t regret; this is something you correct. If you have mistakes, you correct those mistakes, you don’t have to regret, because this is part of the human nature, to make mistakes. But the most important thing if you want to talk about all what’s happening, I think the same question should be asked to the Western officials; do they regret supporting the terrorists in Syria and calling them moderate and at the very beginning calling them peaceful demonstrators, where the people had been killed by them, and they only accused the Syrian government while they knew that their proxies were killing people, do they regret what happened in Syria after six years? They should regret it, not us. Question 5: Could you just name one mistake? You said we must correct mistakes, you correct mistakes. 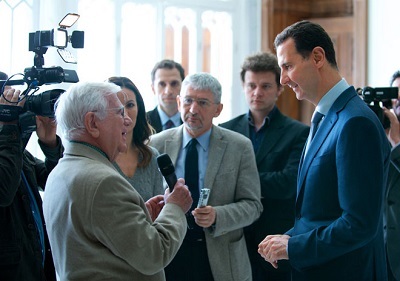 President Assad: For me, I have to revise myself, I’m talking about the policy, while about the implementation, you are talking about a lot of details. Nothing would come to my mind, but this could be individual mistakes sometimes, so you cannot count individual mistakes that you may hear about, but you don’t know exactly what it is till you have investigation. I mean, this is institution work, not president work. Question 6: The whole world is wondering what kind of country will be Syria after the crisis, so perhaps you could share with us your idea, like your reform agenda after the crisis, for example: if this country will be more federal, or if you have, like, reform agenda on social issues like protecting human rights, making the army or security agencies more accountable, this kind of things that all people in the world are asking for you? 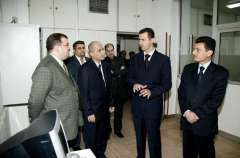 President Assad: First of all, the war itself is a very tough lesson for every society, so I would say that every country after war should be much better, because you learn lessons, and when you have the war coming from outside and they use Syrian proxies beside the foreigners, it’s not enough to blame the others, to blame the West or the petrodollar states that support those terrorists, we all know about this, but this is not enough; at the end you have to look at yourself and to say “what’s wrong with my country?” I’m not talking about me as president, I’m talking about myself as Syrian citizen. So, that’s natural to look at it this way. Now, if you want to talk about how Syria is going to be after the war, it’s not my agenda; my agenda is to open and facilitate dialogue between the Syrians, because this is a national discussion about what’s the political system that you want; is it going to be presidential, semi-presidential, parliamentarian, and so on. 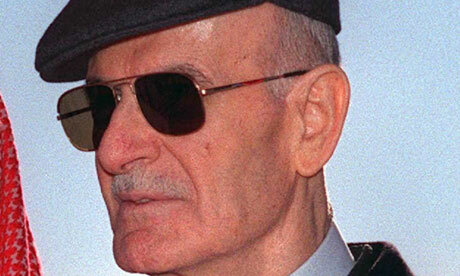 And when you talk about the political system, you can talk about the institutions, because those institutions, whether the army, the ministries, the government, everything else, should be a reflection of that constitution. We cannot talk about it regardless of the constitution and the main political system. That needs a dialogue between the widest spectrum of the Syrian society, because at the end, you’re going to have a referendum regarding that point. The government cannot take a decision, say “this is good, this is bad for the country or for the future.” So, I’d rather not to say my vision for Syria, I’d rather say what’s the Syrian vision of the future of our country. So, it needs a dialogue, but it’s still early to talk about, now we are discussing this, but the priority of the Syrian people now is to fight terrorism. How? It’s a luxury now to talk about politics while you’re going to be killed maybe in a few minutes, you have terrorist attacks. So, this is the priority, getting rid of the extremists, the political reconciliation in the different areas, this is another priority. When you achieve these two, you can talk about every discussion you want to regarding any issue. President Assad: You have this culture; it’s not about the politics, it’s about the culture, it’s about how some people would think, and unfortunately this culture wasn’t part of the origin culture, it’s something new that we’ve been seeing for the last few decades. Why? Because of the influence of the Wahabi ideology that doesn’t accept any other one. That doesn’t mean it only influences the religious people; this atmosphere of rejecting the other could influence everyone in the same society as long as you have it. So, we have it as local focus, local foci, in different areas in the society, and that was an important factor in creating the problem in Syria recently. So, what you say is correct, but it’s not the main culture in the society. If we don’t deal with it seriously, it’s going to prevail, and the whole society will not accept the other part of the society, and this is where you can talk about civil war. Till this point, you don’t have civil war. Now what you have is the fight against this mentality, mainly those extremist Islamist Wahabi groups that have been fighting the rest of the society. But at the end of the war, you may have a different political map. 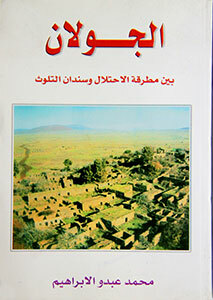 So, no, it’s not a culture, it’s temporary, it’s local, we have to deal with it seriously, it affected us, it affected the European society, and you see the result in your country now because you have the same foci, local foci, especially in France when they isolated these people and they allowed the Wahabi clerics to come and infiltrate their mind, and this is where you are paying the price. That’s why many of the most savage leaders of Al Qaeda in Syria, whether ISIS or al-Nusra, are coming from Europe, not from the Arabic countries. We have so many fighters from the Arabic world, but their leaders are coming mainly from Europe. Question 8: But it’s a problem of education. 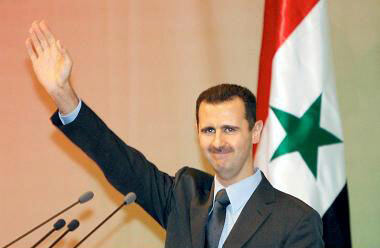 President Assad: because politics will affect the culture. So, all these factors will affect the same… I mean the culture is everything about you; the way you think and the way you behave. I agree with you.